If you’ve read Limpd’s retelling of our Ardbeg 10 vs. Ardbeg Corryvreckan taste off, then you have some idea about how he felt about peat way back in 2010. That was almost exactly 4 years ago, and I am happy to report that Limpd has finally come around to appreciating a fine peated whisky every so often. While he has not yet become a Peat Freak, he at least doesn’t threaten me with various acts of violence (can you say “double tap”? Limpd can!) whenever I bring some smoky beast of a whisky to The Barthenon for one of our neighborhood research sessions. Interestingly enough, I believe that Limpd’s first “Aha!” moment with the glory of Islay was via a taste of Kilchoman’s Machir Bay that we sampled during a WhiskyCast Virtual Tasting session with Mark Gillespie. A few weeks ago, we received an email from the good people of Impex Beverages announcing the release of two new expressions from Kilchoman. Given Limpd’s newfound appreciation for the smoke, we of course asked for a sample so that we could both give it a try, and as you can see in the above photo, Impex happily obliged our request. The ex-Sherry matured cask #85/09, bottled at cask strength of 57.9% ABV, has been personally recommended by Tony Rozga, the Distillery production manager. This whisky was distilled in 2009 and spent over 5 years in a first-fill Oloroso Sherry Cask. Limpd: The ABV comes through on the nose and then, to my surprise, I’m not getting the expected peat notes, but more of a smoked meat aroma. Not barbecue or charcoal; but more of a Hickory Farms note and then a little bit of candied sugar. G-LO: As expected, there’s a good bit of alcohol vapor coming off of this whisky when nosed at full strength. After letting it open up a bit, a sweetened peat aroma comes through. Instead of the usual medicinal notes, I’m getting more of a hickory smoked BBQ scent. Also getting cinnamon, dried fruit, and a touch of vanilla. Limpd: Wow! The ABV might be absent on the nose, but the high octane comes through with a first blast. The alcohol is followed by a good bit of tobacco and then some pepper. I was expecting a little meat (bacon, brisket, etc.) but was presented with more of a tabasco/pepper/menthol vapor kind of a thing. Also, I thought there would be a little more heat in the finish. (Don’t get me wrong, it was hot; but it mellowed to more of a warming heat in the finish.) The finish is long and filled with more spices and menthol flavor. G-LO: Though the medicinal notes didn’t come through in the nose, they definitely show up in the beginning along with some solid pepperiness. That hickory BBQ smoky sweetness comes through as you get to the middle, and the spiciness builds with some hot chile heat coming through. The medicinal notes linger (definite Band-Aids!) as well in the background. The finish brings some vanilla to the party with all of the medicinal, BBQ, and spicy elements coming together for one hell of a finish. The aftertaste is very astringent, with a touch of bitterness as it fades away. Limpd: I thought this was really well balanced with the flavors following one after the other but in a complementary fashion. There was a lot of alcohol in the sample but not so much that it over powered my impressions. The Sherry Matured is worth a try. G-LO: I really like how the Sherry influences the Kilchoman. There was almost a Balcones Brimstone thing going on. This whisky was a great ride! I definitely recommend giving it a try. The PX Finish is a first-fill ex-Bourbon cask #394/09, bottled at cask strength of 59.2% ABV. The Bourbon cask was chosen by the Distillery manager, John Maclellan, and was then transferred into a PX cask. It was bottled once the additional layer of complexity and a balance of what the Kilchoman and ImpEx teams were looking for were achieved. Appearance: Golden yellow with a pale copper tint. Limpd: After the Sherry Matured, the PX Finish seems almost muted in comparison. I’m getting a lot more sweetness (Vanilla, honeysuckle, sugar cane) and then just a hint of peat smoke. G-LO: Once again, you need to let this air out a bit so that the alcohol subsides. While the medicinal notes are more pronounced at the onset, they’re still more subdued than something like Kilchoman’s Machir Bay. Lots of sweetness comes through once you get past the peat. I’m getting musty crushed grapes, brown sugar, cinnamon, and dried fruit. Limpd: Another wow! I was expecting this to be a little softer. Boy was I wrong! The PX Finish is every bit as powerful and flavorful as the Sherry Matured. After the alcohol, the flavors are filled with black pepper, black tar, and dried fruit. The finish is a bit oily with the lingering alcohol vapors providing the heat and a good bit of peat providing the smoke. I’m getting a little subtle sweetness in the finish and a pleasant, lingering, warming heat. G-LO: Much sweeter than the Sherry Matured at the onset, but it’s still solidly backed by that deliciously medicinal peatiness. Hints of brown sugar and spicy cinnamon are upfront. Intensifies at mid-palate, i.e. it gets hotter and sweeter at the same time. Mellows a bit at the finish with all of the sweet, spicy, and smoky bits coming together. The aftertaste is a bit less astringent when compared to the Sherry Matured, and there’s a lingering smoky sweetness. Limpd: To my surprise, I think I liked the Sherry Matured a little better than the PX Finish. While I thoroughly enjoyed the PX Finish, I think there was a little more complexity in the Sherry Matured. Just a few more notes and maybe a little more balanced. To compare the two is almost unfair as while both are from Kilchoman, they couldn’t be more different. I would recommend trying both as they are both certainly worth the effort. However, if it were my money, I think I would buy the Sherry Matured. 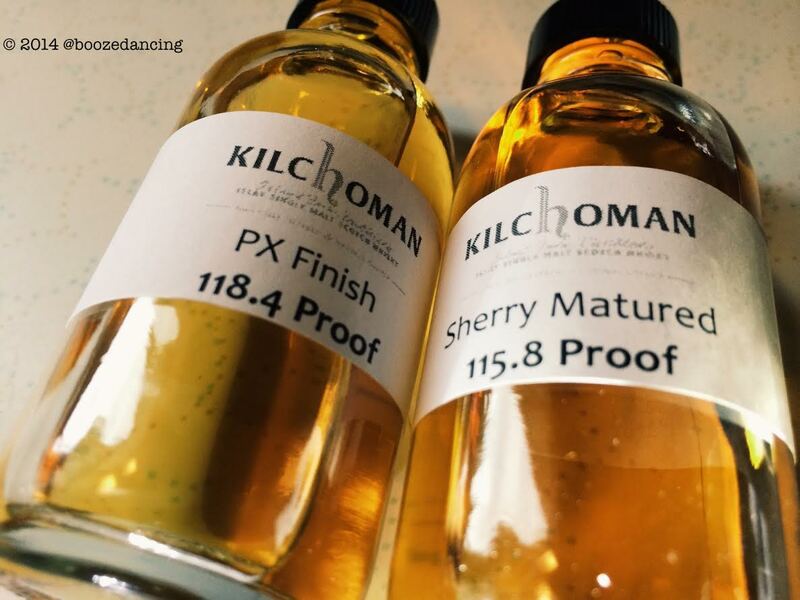 G-LO: Although the base elements of both Kilchoman expressions are very similar, I would say that the PX Finish is the mellower and easier drinking of these two. I can’t pick a winner though, since I really liked them both. For a wild ride, go with the Sherry Matured. For something mellow and easy going, go with the PX finish. Different whiskies for different moods. That is as it should be. The PX Finish is also definitely worth experiencing. Many thanks to the good people at Impex Beverages for sending us these very generous samples!